Why Goa in the Monsoon? Goa a name synonymous to the beach, and its beach related activities has also become popular as a Monsoon Wedding Destination. Arriving from the airport and the drive to your hotel you can witness the lush green experience. All thats barren, turns green in Goa. The Monsoon brings this nice change to the Sun City. 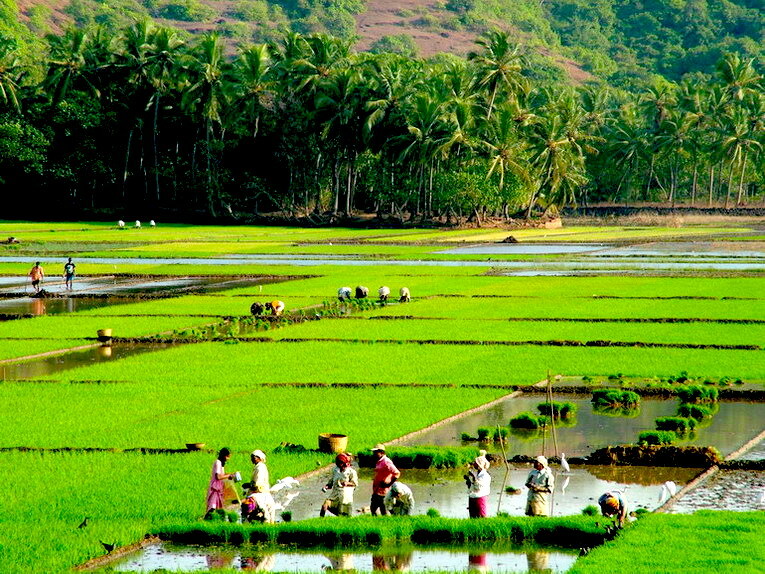 The last of the green paddy fields are still something one can see in this ever-growing destination for the Rich & Famous to plan their destination functions, holiday or to retire to. Why Goa for a Monsoon Wedding? If you are from Mumbai: Well you are greeted by the endless puddles of dirt and grime brought up by the Monsoon Rain. Goa then becomes your closest next best thing to a clean green Wedding. If you are from further North Of India: You are probably still going to be in the peak of the heat. Hence the cool weather and occasional rain in Goa will be one that your guests will enjoy. A Wedding in the seasonal months has its advantages, but with the high demand, the price is slowly becoming above average for rooms, and availability is a major issue. This is especially if you are planning to host about 100 guests upwards, and pay for them all. In the Seasonal months, either you pay top dollar for all the rooms in one location, or you have to house your guests in multiple locations. During the Monsoon, Goa is almost exclusively available to you! Rooms at most decent 3 to 5 starred properties between the months of June to September are within the range of Rs. 6000/- to Rs. 16,000/- upwards per night per double 0n an All Meal Plan subject to a minimum criteria of Rooms being booked. Usually around 50 rooms for a minimum 2 night stay is the good number to be considered for teeth to negotiate. In considering the rates that you receive from most hotels on an All Meal plan, please do look for the fine print. What is the Meal Structure for each Meal (eg. the Number of Veg and Non Veg Items on the Main course, the number of deserts etc. Most hotels should give you a minimum of 3 Non Veg + 4 Veg for the Main course plus the Rices and Deserts etc. Starters is usually an add on. The way to go here, is first ask for the Structure in your initial enquiries, don’t worry about what the items will be at this stage (eg. Butter Chicken etc), as long as you know what the structure is , and also ask for a Menu that you can at any later date preferably a month before the Wedding fill in the slots. Note that Prawns, Lobsters, crabs and certain other sea food are not considered in the Non Veg criteria. Ask for exclusions to the Non Veg category. For Lunch functions – The Hotel’s basic structure is adequate enough. Starters / Aperitifs : This is usually skipped from most Hotels initial ALL MEAL PLAN rate to you, hence this could be added on at an extra cost or negotiate to be included in your Rate. However, for a lunch function, I would give this a skip, and save your negotiations for something more relevant. This will probably not be considered in the hotels rate to you for their All Meal Plan (APAI), hence my suggestion is to try and get one of these included in the same price and if you are a good negotiator even both. Don’t forget to ask for an exclusive mini hall for these High Tea. If you are 100 guests and above all your meals should be provided in an exclusive banquet function area and not as a part of the general restaurant area that would be used for the regular hotel guests. Try to create a function around each meal. Eg. The High Tea’s could be around a Mehndi Function or Pooja Functions.. However, this is Not adequate enough for a Banquet Dinner Function spread. Your Menu should ideally have double this quantity, plus the additions of Live Counters frying the Fish live on a Hot plate, a Pasta Counter – Your Deserts should have a nice animated Chocolate counter.. and don’t forget to welcome your guests with Starters floating for the 1st 1.5 hours of unlimited service. Good Cocktails made by a cocktail maker either from the hotel, or bring a flarer/ juggler from out. This can range from Rs. 30,000 for a small hall to Rs. 1,50,000 for their main hall, but this can be negotiated down in the negotiation. Especially if your Room count is more than 50 rooms. Most hotels do not offer banquet service on the beach but will allow the use of the beach in front of their hotel either at a charge or no charge, be sure to get clarity on what exactly is being offered and not offered and are they including the Govt Licences mandatory to use the beach or is this responsibility that of the host which in turn you could pass on to your Event Planner. Govt Licences ranging from Rs. 25000/- to Rs. 45,000/- upwards depending on duration and space required on the beach ; would need to be procured. Your Event Planner may charge a certain service Fee for the running around. As besides application to the Tourism Office, the letters are also copied to the local Panchayat and Police Department. In some villages, Licences also need to be procured from the local Panchayat. Your Wedding Planner, would be able to guide you accordingly. Do keep in mind that during the months of June to Sep we have the monsoon here in Goa, and the months of July and August being peak. So, you may want to skip the idea of a beach function and even if you were to consider a covering – the winds are real high. September month is usually the trailing end of the monsoon and one could consider outdoor events, as the weather is more like English weather – a good blend of rain and sunshine hence like an event planned in the UK – Be prepared for the rain in the middle of what starts off as a Sunny Day !! Beverages are charged on actual consumption and most hotels have Bottle Banquet rates, which is cheaper then their per glass rate and about 40% more expensive than the market retail bottle rate. In a bottle rate, you pay by the bottle, which means the moment the seal is removed, you pay. However, the opened seals are ones that you can take away or carry on to the next function. On your last day, consider having a party of your close friends and relatives with this leftover booze. Also, my suggestion is to pre-determine the Brands of Alcohol to be kept at each function, and if you have extra help – pre-determine with the hotel on a cap for the number of bottles to be kept at the bar with instructions of when its about to get over, then the floor Supervisor comes to you the host to give further instructions on whether to add more bottles. This way you can keep some control over the eventual bill or at least be aware of your costs. In my experience, its the soft beverages that breaks the bank. Non Drinkers can down 6-7 cokes in a night, whilst Spirit drinkers would do an average of 4 with the chaser.. hence your non drinkers may cost you more then the drinkers. Consider this and take a Soft Bev package Only , on an hourly basis from the Hotel. Note: Premium Alcohol like Chivas or Black Label and Absolute is a lot more expensive in India as compared to duty free prices. So, my advice is to stick to the local brands. This budget for soft and alcoholic beverages can vary drastically but I would keep a figure of 30% of Food bill for budgeting sake.